While looking through a listing of innovative new tools out over the past year, I came across the Barbara K! Power-Lite Cordless Drill. While I tend to buy my cordless drills based on amp hours and torque, this company focuses on making their products light weight and easier to use for women. 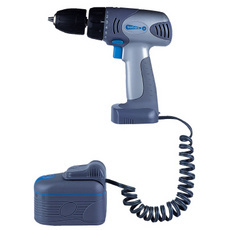 The Power-Lite drill is a 12 volt, and features an adapter that allows the user to wear the heaviest part of the drill, the battery on their hip. This is a consumer grade drill with variable speed forward and reverse, a keyless chuck, charger, and a handful of bits in a carrying case. The battery can be attached directly to the drill, or worn in a pack on the hip. The Barbara K! website doesn't list any technical details, like weight or amp hours on the batteries, but the Home Depot site said that it was 4 pounds with the battery, and about 2 pounds without, which is in line with my professional grade Dewalt 12V drill.